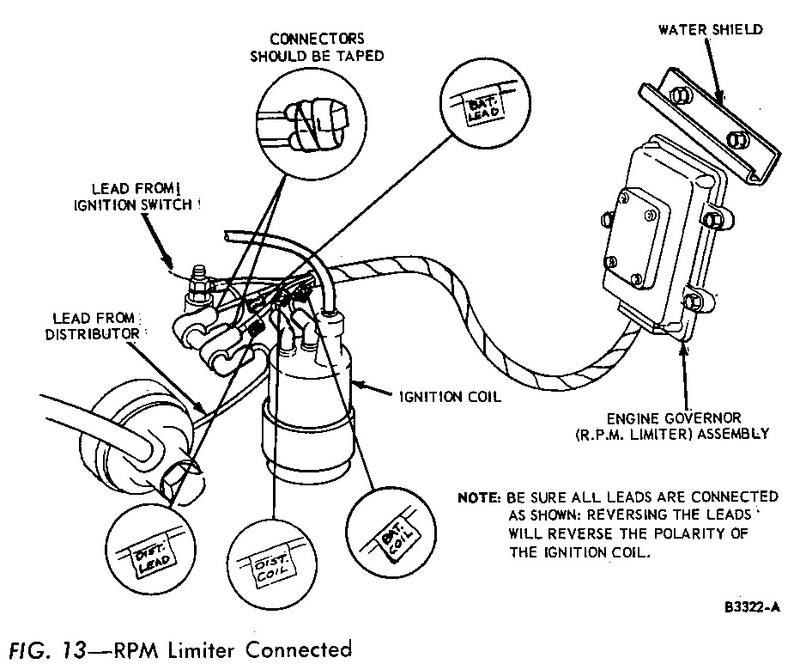 Electronic engine governors, also known as RPM or rev limiters, were used on 1970 428 Cobra Jet engines when the car was equipped with a manual transmission (they were also used on Boss engines, but that's not what we're here for). 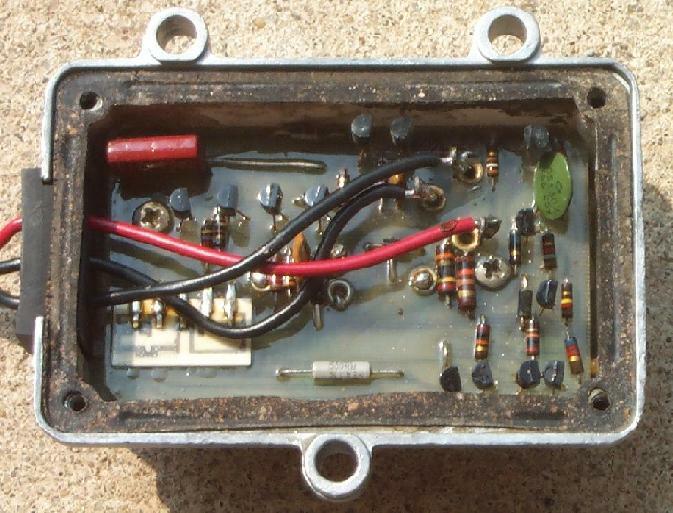 The 1975 Ford Master Parts catalog only mentions use with a standard transmission for 1970 428 CJ and SCJ, and I haven't been able to confirm factory installation on a car equipped with an automatic transmission. It seems that a good many 1968 and 1969 owners were finding ways to cause RPM-related warranty problems for Ford (imagine that! ), prompting the addition of this electronic nanny for the 1970 model year. Rev limiters are mounted in series with the primary ignition circuit and will ground out the primary current to the distributor when engine RPMs exceed a preset limit, preventing the spark plugs from firing. We've received multiple reports of 1970 Mustangs built through the summer and fall of 1969 that don't appear to have come with a rev limiter even though they were equipped with a manual transmission. 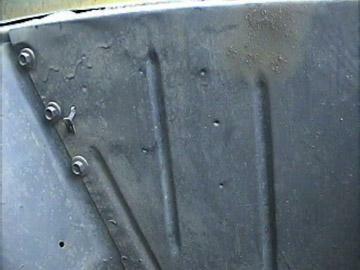 The fender aprons on these cars have the dimples for locating the mounting holes, but they've never been drilled and the aprons appear to be original. Broad installation may have started sometime after the start of production. 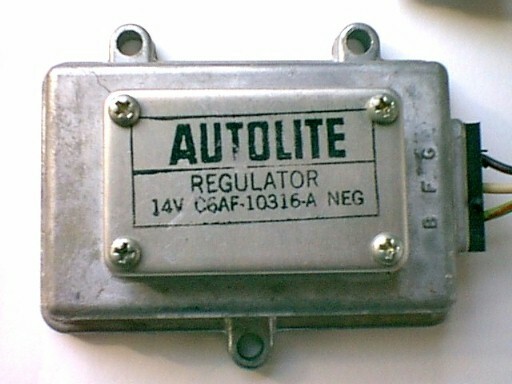 Units can be identified by a black ink-stamped engineering number (D0ZF-12450-A), RPM limit (5800), and date code on the unit's cover. The date code refers to a week number in a particular year; for example "6938" refers to the 38th week of 1969. Original units typically have reddish ink or paint covering at least one of the back cover screws to help detect warranty-violating tampering. Note that there are reproduction decals of the front stamping and reproduction stamps available to apply the front stamping, so you shouldn't always believe what you read on the external cover. Watch for the "6938" and "6933" dates in particular because all of the reproduction decals and stamps that I've seen seem to use these particular date codes. To make matters worse, several vendors offer "show-only" units that do not have any internals. Don't be fooled into buying a gutted or non-functional unit when you think you're getting a fully functional unit. Here's a series of pictures showing each of the cover markings that I've seen. Note the font differences between the original stamping and the reproductions. Thanks to Allen Cross for the repro stamp picture. The original wiring harness, like all Ford harnesses, wasn't really "taped up" - it used unglued plastic strip, stretched while being wound about itself to produce self-adhesion. After being folded a few times, the excess harness was held in that position with two small strips of narrow masking tape. 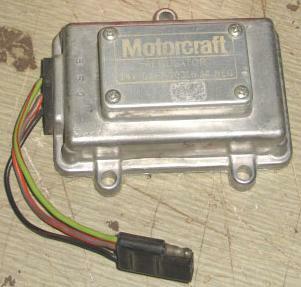 Interestingly enough, it's quite easy to put together a non-functional rev limiter using an earlier solid-state voltage regulator used on several other Ford vehicles. Both units use the same aluminum case, though the ink stamp on the cover is different. 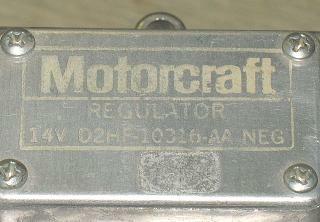 The regulator (service part number C6AZ-10316-A, Motorcraft part number GR-374) is marked with one of several different ink-stamped engineering numbers including C6AF-10316-A, C6TF-10316-A, and D2HF-10316-AA. 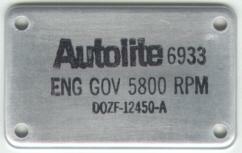 An ink-stamped date code in the common Ford format (like 8B20) is typically found on the back. Change the wiring harness, clean up the cover and apply an ink stamp or decal, and you have a non-working "rev limiter" that's difficult to distinguish from the real thing. 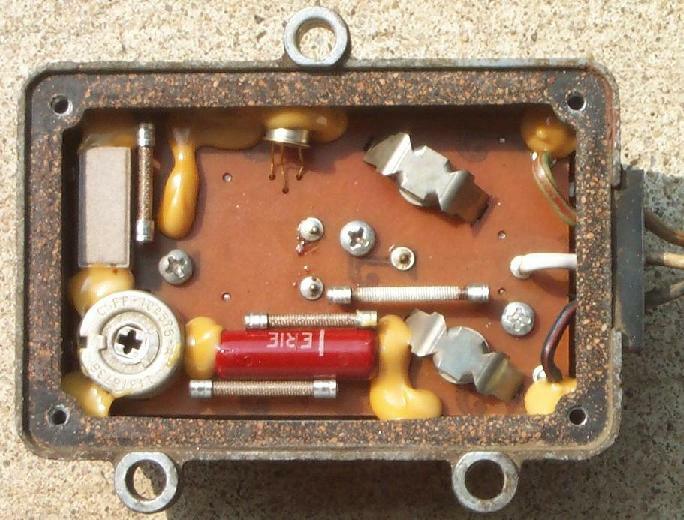 Here's what the voltage regulator looks like from the outside and inside (click on the first two images for a more detailed view). 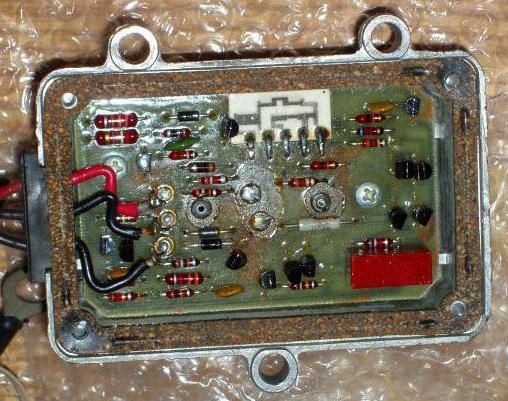 The three images above are provided courtesy of Jim Guck of Elmers Auto Parts Inc.
OK, so what does the inside of a real rev limiter look like? I've seen two basic types, with the only differences being the stamp on the cover and what's inside the unit. Being very difficult to test I can't be sure if these are both 5800 RPM 428 Cobra Jet rev limiters, or if one of the types is a 6150 RPM Boss rev limiter. If anyone has a confirmed original unit that they can look at, please let me know and perhaps we can clear up that bit of confusion. Additional research continues to produce a lot of conflicting information. I've had different people look at known original units, with one reporting that their 6150 RPM unit is identical to type 1b below, one reporting that their 5800 RPM unit is identical to type 1a below, and the other reporting that their 5800 RPM unit is identical to type 2 below. It may be that all of these are 5800 RPM units, with the differences attributable to normal production variances among multiple suppliers. 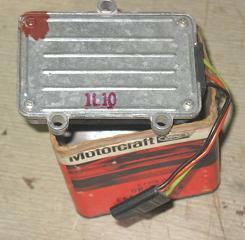 Thanks to Pat Whalen we have a picture of a NOS 6150 RPM Boss rev limiter. 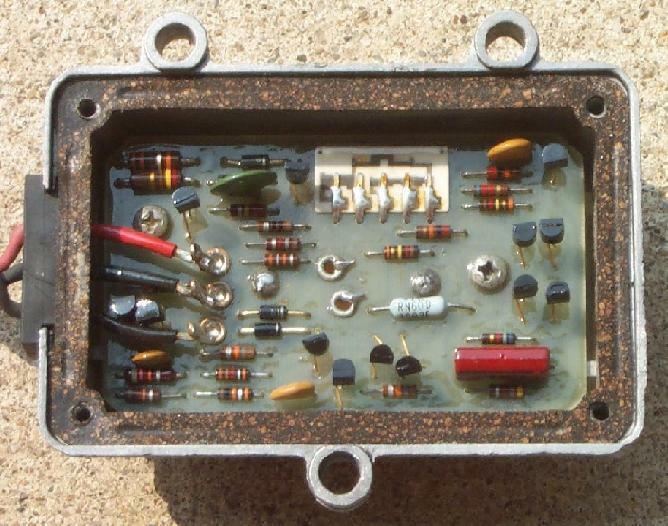 Note that this unit looks similar to the type 1a limiter, but not exactly. Here are shots of all three types. 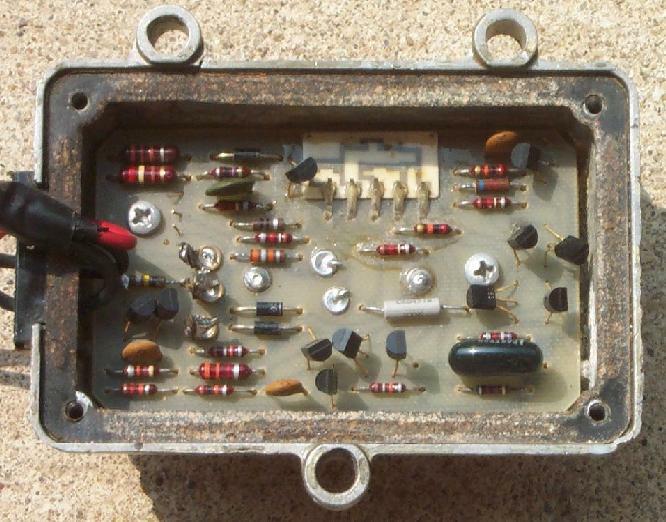 Note the similarities and differences between the first two, and the distinctly different circuit board layout of the third. Thanks to Bill Walker for the picture of his fender apron.